Kazakhstan is big and the best form of transport is the train. Consequently, the trains are often full and it can be hard to get a ticket. When I say best form of transport, I don't mean only for people. It's good for fruits and vegetables too. I always travelled "platskart" (like coupé but no door : open compartments of 4 bunks, with two more across from the gangway). In the train from Almaty to Shymkent, I met a couple on their way to the wedding of their daughter. They invited me to come along, so I had an nice evening, with much toasting with vodka, along with plenty of food. One dish was a head of a sheep : guests receive a piece of meat / skin from the forehead. Chewy. 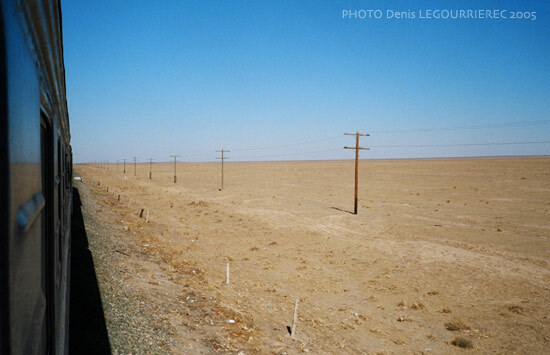 I also went by train from Turkistan to Aralsk although the arrival time at 3am was not very convenient. That train was quite something : all the upper storage places were jammed packed with boxes and boxes of tomatoes or cucumbers and with bags of potatoes. Several entire compartments were full from floor to ceiling with bags of potatoes. Our feet were resting on a layer of more bags of potatoes. A woman explained that there are no fresh products in the Aral region so everything is brought there from Turkistan by train. which gives a feeling of how vast the country is. Gradually, at each of the many stops, more people boarded the train and we ended up about 15 people in a space where normally 8 people seat. Very social but no much space, considering also the number of boxes, bags and luggage. No seat numbers matter, it's like a bus. At some point, we passed Baikonur town, but it was dark, so I could not see much. The launch site is situated some 50 km away, way out of sight from the train line. At the next main town (Kazalinsk), many people got off the train and I could get some space to lie down, since my stop was at 3am. The train ride from Aralsk to Aktobe (could not get direct train to Samara, it was fully booked) was done overnight. It was also packed. Some people had enormous bags, barely fitting in the gangway and they were struggling to get the bags out of the train when we got to Atkobe. I spent a day in Aktobe, where there isn't really much to see and where the only few internet places were expensive (3 USD an hour). Fortunately, I met some students and spent the afternoon with them before taking a train in the night to Samara, Russia.